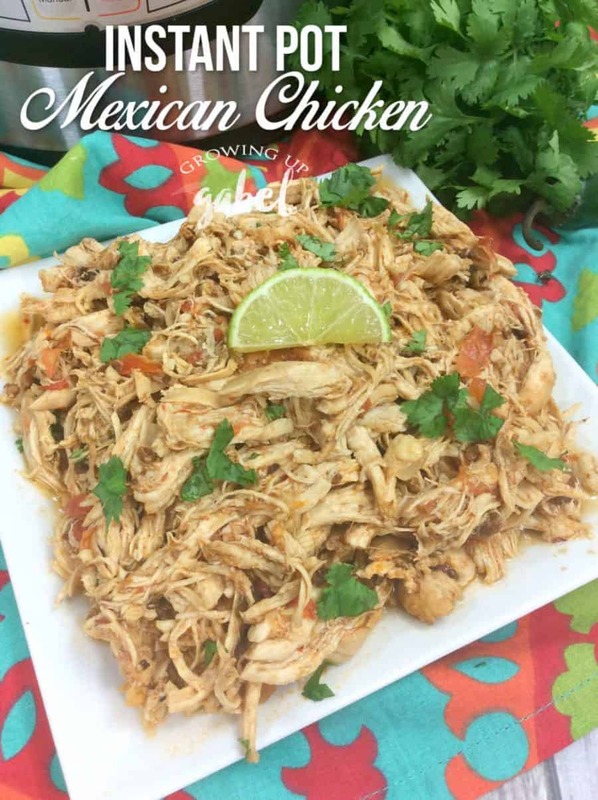 Instant Pot Mexican chicken is great for tacos, bowls, and enchiladas! Ready in under 30 minutes, turn chicken breasts or thighs into an easy dinner. I love any recipe that's ready in half an hour. If it can be made with items I already have on hand, then it's a true winner. After discovering chipotles a few years ago, I'm also a huge fan of any recipe that uses them. Don't be afraid of them if you've never tried them. You will also fall in love. Mexican chicken is a versatile recipe that you can make in about 30 minutes. You can make it to serve for dinner or freeze it for later. You probably have most of the ingredients already in your kitchen, too. This is also a great recipe if you have an Instant Pot but are afraid to use it. Haul it and let's make some chicken. 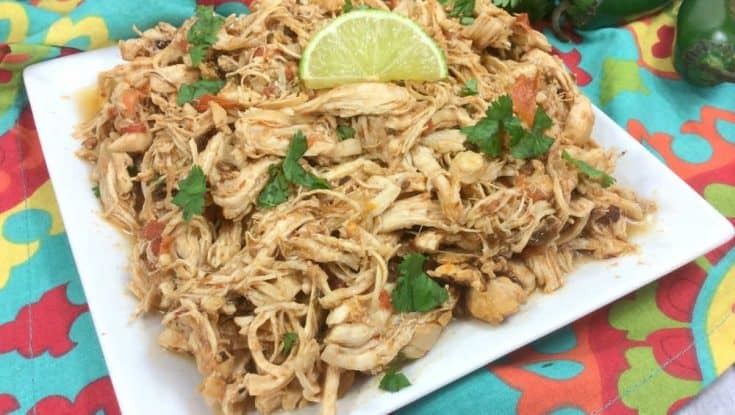 Mexican chicken is pretty much a dump and cook recipe. Start by adding olive oil to the bottom of the Instant Pot. Next, add the boneless, skinless chicken breasts in the Instant Pot. 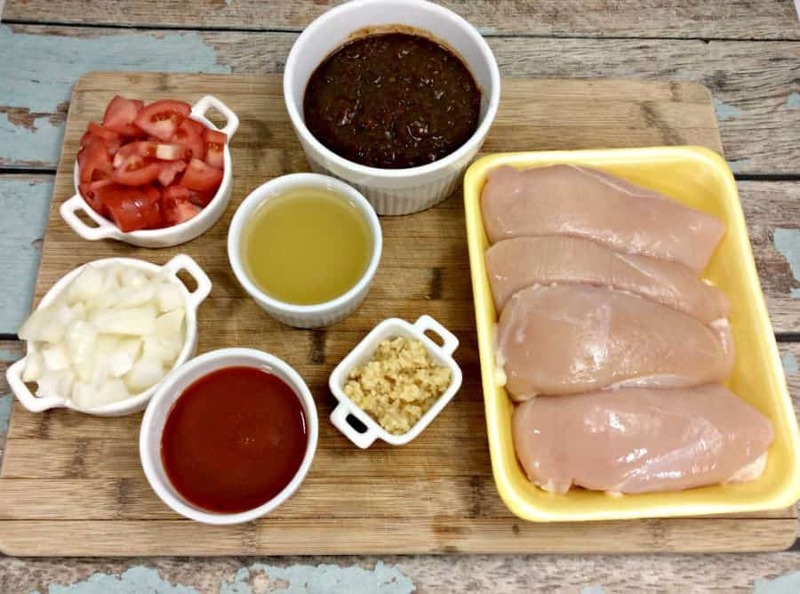 You can also use boneless skinless chicken thighs in place of the breasts. I actually prefer thighs to breasts. There is no need to dice or chop the chicken. Just put the entire breasts or thighs right in the pot. Next, add the tomatoes, onions, minced garlic and tomato sauce on top of the chicken. Just dump it all right in there. When cooking in the Instant Pot, or any pressure cooker, you need at least a cup of liquid. This recipe uses the salsa for the liquid. Feel free to use any salsa you like, but chipotle salsa is amazing. Chipotles are smoked peppers. They give the chicken a nice smoky flavor that is amazing. Chipotles are life changing. 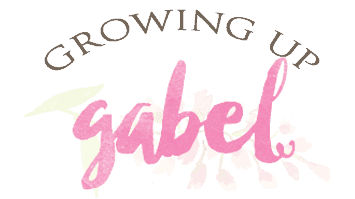 They are seriously amazingly delicious in many recipes. Check out chipotles in this yummy Bacon Chipotle Pimento Cheese Gourmet Grilled Cheese Recipe. If you can't find chipotle salsa, make your own. 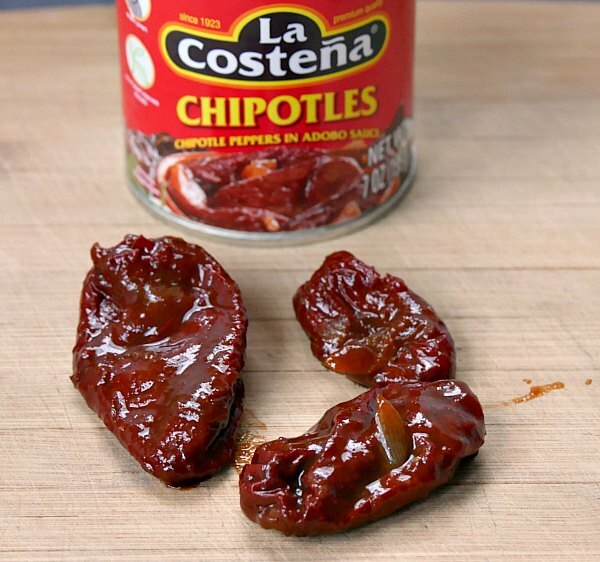 Combine a can of 12 oz can chipotles in adobo sauce with 4 oz of salsa. And if you are still afraid of chipotles, just use your fave salsa. Pour the salsa directly on top of the chicken. 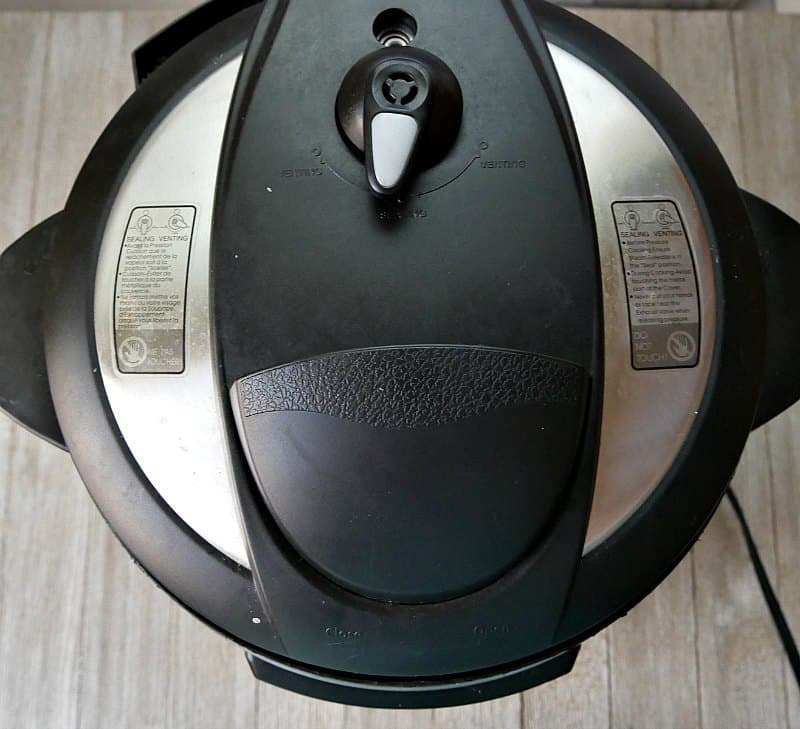 Place the lid on your Instant Pot, and lock it into place. Remember to place the vent on seal. Use the manual setting, and set it to 13 minutes. The Instant Pot will come to pressure first, and then cook for 13 minutes. Once the 13 minutes are up, release pressure by doing a quick release. Be careful to use a wooden spoon or other item to open the vent. Do not open it with your hand. Once the pressure has been released, carefully open the top away from you. Use two forks to shred the chicken right in the pot. Garnish with lime juice and chopped cilantro. 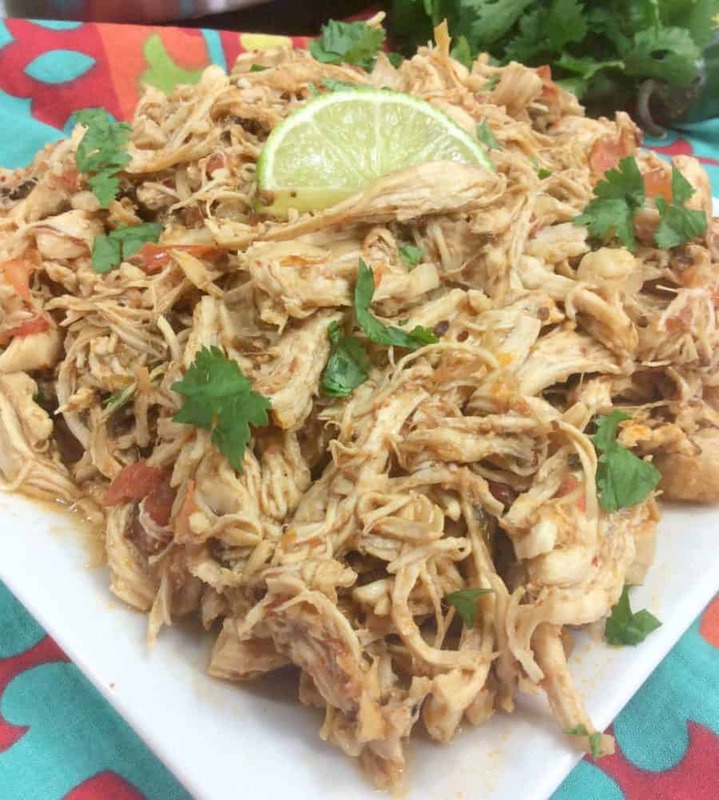 Serve the shredded Mexican chicken over rice with beans for a rice bowl. You can also use it to make Chicken Enchiladas or Chicken Tacos. Add olive oil to the bottom of the Instant Pot. Next, add the boneless, skinless chicken breasts or thighs in the Instant Pot. 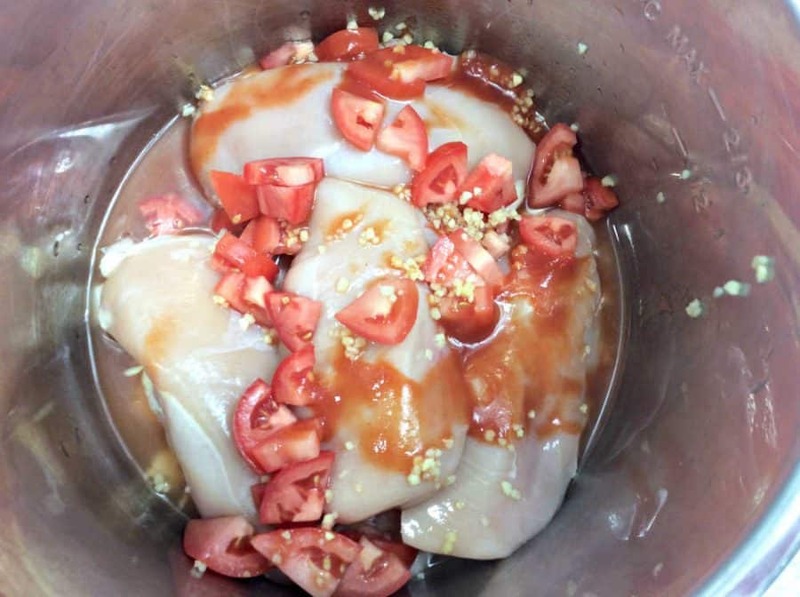 Add the tomatoes, onions, minced garlic and tomato sauce on top of the chicken. Pour the salsa directly on top of the chicken. Use the manual setting, and set it to 13 minutes. 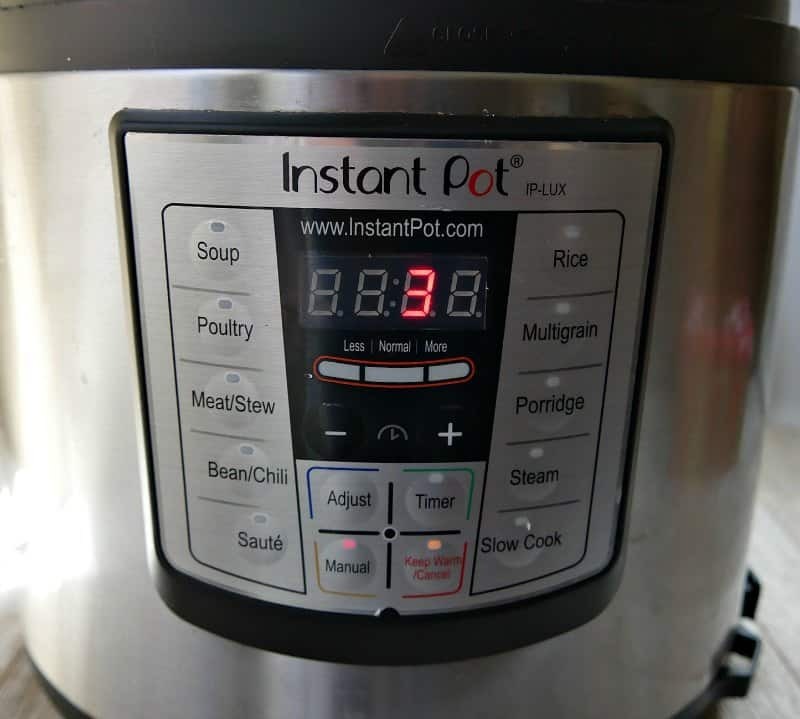 The Instant Pot will come to pressure first, and then cook for 13 minutes. Once the 13 minutes are up, release pressure by doing a quick release. Be careful to use a wooden spoon or other item to open the vent. Do not open it with your hand. Once the pressure has been released, carefully open the top away from you. Use two forks to shred the chicken right in the pot. Garnish with lime juice and chopped cilantro.